Exhaustive exercise leads to an activation of blood coagulation, but the implications of this activation are still unclear. The aim of this study was to investigate if a hypercoagulant stage exists after exhaustive treadmill- or cycle exercise; intrinsic and extrinsic endogenous thrombin potential (ETP) were measured by using the method of Hemker et al. . Thirteen healthy male subjects underwent an exhaustive treadmill (TR) or cycle (CY) ergometer test and a control-day in random order. Blood samples were taken, repeatedly, after a 30 min rest, immediately before and after, and 1 h after exercise for measuring intrinsic and extrinsic total thrombin potential (TTPin, TTPex) (including free and α2-macroglobulin-bound thrombin) and endogenous thrombin potential (ETPin, ETPex), aPTT, PT, F1 + 2 and TAT. In comparison to the pre-value taken immediately before the exercise, the intrinsic TTP was significantly (p < 0.05) increased directly after exercise (TR-TTPin, + 11.6 %; CY-TTPin, + 11.5 %). In contrast, ETPin remained unchanged after both exercises. Additionally for TTPex and ETPex, no changes after exercise were detectable. aPTT was significantly (p < 0.05) shorter after exercise (TR-aPTT, - 16.2 %; CY-aPTT - 17.5 %), F1 + 2-concentrations were higher (p < 0.05) (TR-F1 + 2, + 21.2 %; CY-F1 + 2, + 9.8 %), but TAT remained unchanged. Differences between TR or CY could not be determined. 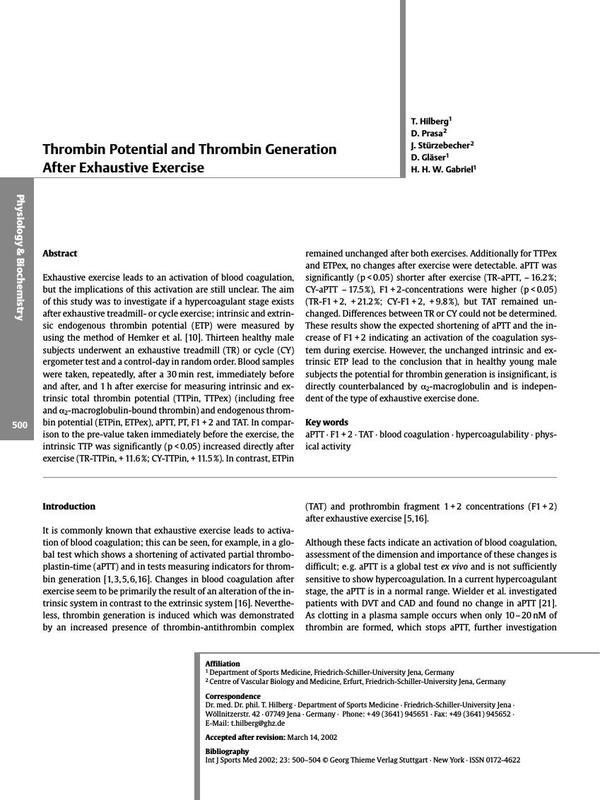 These results show the expected shortening of aPTT and the increase of F1 + 2 indicating an activation of the coagulation system during exercise. However, the unchanged intrinsic and extrinsic ETP lead to the conclusion that in healthy young male subjects the potential for thrombin generation is insignificant, is directly counterbalanced by α2-macroglobulin and is independent of the type of exhaustive exercise done.